In 2014-15, John Greer Grade School piloted a 1:1 teaching and learning environment in four classrooms. The pilot was a huge success. In 2015-16 all students in grades 3-8 have Chromebooks and learn in a 1:1 environment. By 2016-17 all students in grades 1-12 will have devices that support 1:1 teaching and learning in the classroom. 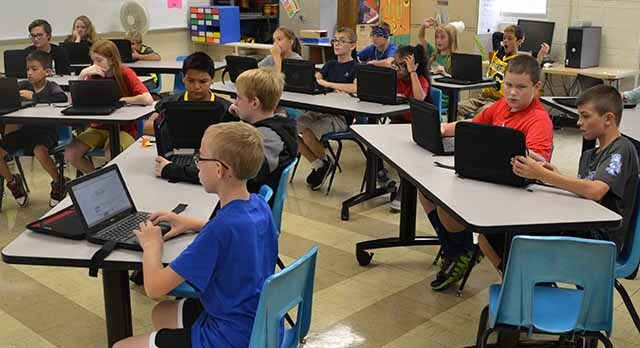 Hoopeston Area School District has made the commitment to issue each student with a district-owned Chromebook or other device to use while they are enrolled in the district. Students are responsible for the care and maintenance of their devices during the school day. If a student damages his/her device, the student will be responsible for the cost to repair the device, but a loaner will be issued to the student while his/her assigned device is being fixed. Education has to become more than just standardized tests. We live in a digital age, dominated by information that sees technological advancements. happening at an exponential rate. We must prepare students for their futures, not our pasts.